I am the mom of an only child and I tend to obsess over everything involved in mothering one child. Teacher gifts are no exception. 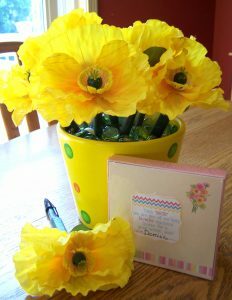 When my son was finishing up his year in Kindergarten, I searched high and low for a really cute, but also practical, and handmade gift idea for his teacher. I wanted it to show that we took some time into it, but for it also to be a gift that wouldn’t be thrown into the pile of other ‘don’t-know-what-I’m-going-to-do-with-this’ handmade teacher gifts. Hence, we (or I) decided on making these uber cute flower pens. These are so easy to make, it’s actually kind of embarrassing. The links in the below list of materials are Amazon affiliate links. If you click on them & make a purchase, I will receive a very small percentage – like a few cents. However, this does not affect the price you pay for these items. You can purchase all of the above items on Amazon by clicking the links. I got the floral tape, the artificial flowers, the cute polka dot pot, and the flat glass marbles all from the Christmas Tree Shops in Hagerstown, MD. Love that place! I bought the pens from Weis grocery store. 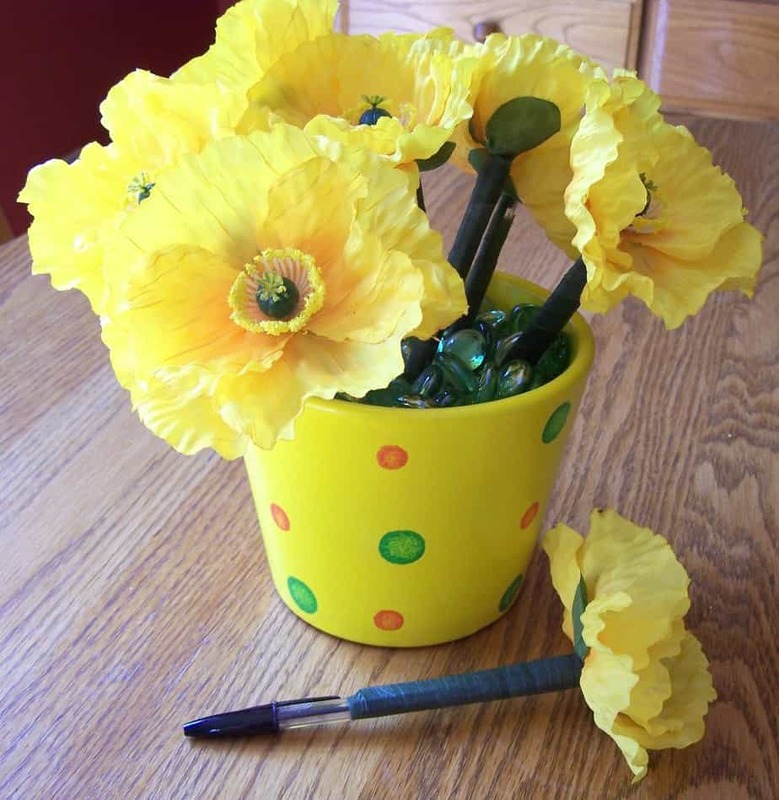 With the wire cutters, cut the stem of each artificial flower so that the top of the flower is flush to the bottom of the pen and the end of the stem is the length of the pen up to the cap. Once you have cut all of the artificial flowers, unroll the floral tape and wrap it generously around the stem and the pen, starting from the bottom of the stem to the very top of the stem. The floral tape sticks to itself, so it will stay in place once you’ve wrapped all the way to the top. Once you have completed all of the pen flowers, pour your flat marbles inside your container and then stick the flower pens inside to form an arrangement. And there ya have it. Not much to it, but oh so cute! My son’s teacher’s favorite color is yellow. We also included a little notepad to go with the pens. It’s a decoration and a useful item all at the same time! This post was shared on Somewhat Simple Blog’s 11/15/12 Link Party! This post was shared on Jembellish.blogspot.com 1/7/13 Link Party!